En 1994, au cours d’un congé sabbatique, Jean-Paul Debenat effectue des recherches sur l’Homme Sauvage dans le Pacifique Nord-Ouest. Il séjourne dans l’état de Washington et rassemble des documents et informations sur le Sasquatch, « l’homme de la forêt », en langue des Indiens Salish. I met Jean-Charles Pichon for the first time in the winter of 1980. At that time, I was working on my dissertation for a Ph.D. in Comparative literature which was centered on American S.F. writer Robert Anson Heinlein. My topic was: the esoteric structures in Robert Heinlein’s four Hugo Award-winning novels, including the cult-book Stranger in a strange land. « You wish to know whether the works of Robert Heinlein contain the great myths, or ideas as Plato defined them, or structures as Levi-Strauss called them, or archetypes as Jung termed them, or even gods or deities if you prefer, the myths which are driving forces behind the historical avatars of humanity. Your problem is a simple one: through the ages what are the great works that have survived? Precisely the ones which tell the mythical story of humanity, the real story, that which is apparently hidden, esoteric. These books will never die while hundred of publications are still-born. They are called: the Gilgamesh epic, the Popol-Vuh, The Bible, Homer’s Odyssey, the Coran, the Divine Comedy,Cervantes’Don Quixote, Shakespeare’s plays, part of Victor Hugo’s writings etc. You will only have to re-read them in order to decide whether Heinlein’s mythology in its modern guise compares favorably with the great ebb and flow of ancient mythologies ». I was dumfounded, almost speechless. On my way back, I kept trying to assess the Herculean task which lay ahead of me. Jean-Charles Pichon had lent me his trilogy La Vie des Dieux (The Lives of the Gods) published in 1972. I read it seriously during the following summer in the small farm-house I used to rent in the countryside. On my desk lay an encyclopedia and several dictionaries of mythology. Every minute I had to check who were Marduk, Apis, Horus, Brahma, Osiris or Baal to name but a few among the most well-known. Volume I dealt with the Gods of the elements (Les Dieux Phénoménaux), fire or light, water, earth, air or space. Indeed, one is confronted with a unique God, under His various aspects or modalities, that Teilhard de Chardin called the Omega or Omega point. The shamans, the wise-men, the Gnostics and the cabalists among others strove at identifying His many names. 1 – The God of Fire: Yahweh speaks. 2 – The Goddess of Water: Wisdom speaks. 3 – The God of Air: Wind speaks. 4 – The Goddess of Earth: Mother speaks. What do these gods have to say? « You put my very presence into question, for it is quite recent and many of you do not even know testimony that I have come back. However, one thousand signs bear testimony to my return: holism and atomism, nuclear science and psychoanalysis, the all-powerful technocrat and the cosmic spiral, the thirst for knowledge and above all the urge to comprehend which gets hold of everyone. As well as the cult for skin-diving, for baths and hygiene and the revival of all the virtues of water. Without knowing it clearly-although you will know it tomorrow – you are worshipping me. My name is Sophia ». J.-C. Pichon says that in order to approach God – through His names – Man must renounce what he calls reason, invert all his previous concepts (i.e. must convert himself) and deny what he used to hold for certain. I tend to believe that Pichon was either sufficiently humble or boisterous to apply this rule to himself. A number of writers were foolish enough to identify with God and very few succeeded. One notable exception was Thomas Mann with his own interpretation of the Old Testament. If Pichon felt assured enough to use the first person in Volume I, he dons the second person – in French « tu » – in Volume II, Les Dieux Humains (The Human Gods), thus establishing dialogues between the gods; for instance in part II entitled « The Messiah », the Virgin speaks to the Messiah. (The Messiah in question bore many names before settling for that of Jesus or Buddha. He once was Osiris, Apollo-dolphin, Job’s Leviathan, Jonah’s Whale, Vishnu’s Great Fish). « Minute by minute, over a stretch of one thousand years, your peoples shared your baptism in the Water, your quest and your mission on the Earth, step by step, and your passion in the Fire and your ascent towards the Heavens, worshipping you in turn as a god of Air, Earth or Fire and more continuously as the Ichtus, the One who nourished, who suffered, who vanquished, from the first to the eleventh century. In these first two volumes, Pichon showed the extent of his erudition mentioning his sources through hundreds of notes and quoting authorized specialists as well as innumerable ancient texts. Everyone had to admit that from a historical point of view Les Dieux Phénoménaux and Les Dieux Humains were well documented. However, for some readers, Pichon proved critical, in a sense, when he commented on the Four Gospels. In Les Dieux Humains, he clearly shows the major differences in Matthew’s, Luke’s, Mark’s and John’s accounts of Jesus’ life. Matthew remains close to Hebraic messianism which would not tolerate that the Law be abolished! Luke’s own symbol is Taurus, the Bull that the Sumerians called Marduk or God of Creation. Thus Luke who wrote under Nero’s reign, the emperor-artist, emphasizes the power and beauty of Jesus’ word. Mark spells like Mars almost, the God of War and Pichon compares his concise style to the arrow which flies straight to its goal. Under Luke’s pen, Jesus appears as a violent man whose furor is aimed at the Pharisees and the merchants of the temple. Matthew’s portrait of Jesus is based on upon the gods of Air, Luke’s upon the Earth and mark’s upon the Archer or Sagittarius with his bow and arrow. Ultimately John was to depict Jesus in his proper perspective through an alliance between the Archer and the Serpent, or if one prefers, between Eros and Sophia. John describes Jesus as born from Hermes and Venus-Aphrodite: a hermaphrodite whose maleness is revealed through the long beard and burning fire of the eyes and whose feminine side is reflected through the floating hair and long robe. John stresses in Jesus the presence of the god of the unconscious, the inner word which is to be symbolized by the scorpion. He shares with women a quality, intuition, which helps him understand and consider them as sisters. Be they Martha, Mary or Mary-Magdalene. Although the latter may have been more than a sister… A trait that Pichon suggested in a novel Ceci est mon corps (This is my body) published at his own expense in 1947, and which compares favorably with Nikos Kazantzakis novel The Last Temptation of Christ. It is in the third volume that Pichon gave rein to the poetic gifts which turned his trilogy into a remarkable combination of erudition and style. In Les Dieux Etrangers (The Alien Gods), Pichon considers that the gods did not only shape the past but that they are preparing the future. Especially one of them, the Alien, the Outsider who comes from elsewhere. His various components are already at work: the bird, the robot, the tree, the balance, the Mirror, the Holy Grail, all have their role to play whether it is negative or positive. For the birth of the new god already proves arduous. In fact, the question Pichon asks himself is: « Quel génie remplit l’amphore? » [What genius fills the jar?]. It is too early for us to see Him but everybody is longing for Him; « Him » is the god of liberty indeed. Still, liberty means something different for the rebel and the citizen, for the socialist and for the poet. Nonetheless the answers that Pichon provides are among the most inspiring one could ever expect. A few years ago, while on a holiday in Algeria, the one and only book I brought with me was Les Dieux Etrangers whose short paragraphs I would read like poems. I made a few enemies by letting some Algerian acquaintances browse through the book. It hurt their fundamentalist and nationalist feelings. They would have been angrier had they studied L’Islam dans le Coran (Islam within the Coran) published in 1981 by Editions Sophon/Coherence. Incidentally, this publishing firm was created by a French industrialist out of her admiration for Les Dieux Etrangers. The firm’s catalog includes four of Pichon’s esoteric works. Pichon’s later works as published by Sophon/Coherence became more and more complex and require some serious esoteric initiation on the part of the reader. However, L’Islam dans le Coran is an attempt at deciphering the sacred book of the Arabs. According to Pichon, the mysterious letters one finds preceding the Surats should be translated into numbers. These numbers then provide clues in order to understand the prophetic dimension of the book. For the Coran should not only be read as a spiritual guide but as a commentary on the various historical periods Mankind has been confronted with and will be confronted with. Also published by Sophon/Coherence, Le Jeu de la Réalité (The Game of Reality), Volume I & II, analyzes works as different as The Book of Ezechiel, Franz Kafka’s, Alfred Jarry’s or even painter Marcel Duchamp’s works. In them Pichon found a common structure, a sort of machinery whose interactive cog-wheels, if I may say so, and their layout constitute a complex figure. It is meant to represent the great cycles of Humanity. The courageous reader feels rewarded for his efforts when he comes to the conclusion that a number of works would be practically meaningless if Pichon had not exposed their underlying machinery or structure. Mircea Eliade himself in one of his later books affirmed that only a historian of religions could trace the hidden motif which might render contemporary works of art or even phenomena meaningful (Occultism, witchcraft and cultural fashions – 1976). In his own demonstration, Pichon admits that he originally was inspired by Michel Carrouges’ fundamental study Les Machines Célibataires (The Bachelor Machines). However, in spite of the admiration I bear to the trilogy La Vie des Dieux, I am bound to admit that the work which left the deepest impression is L’Homme et les Dieux (Man and Gods); first edition: 1965; second edition: 1968; reprinted in 1986. One has to remark that this book was out of print for 16 years and there was good reason for it. Nethertheless L’Homme et les Dieux is a formidable achievement extending over 560 pages. The subtitle indicates that it is a « thematic history of Humanity ». The themes in question are the religions of mankind from the earliest cults of the cavemen (15 000 to 20 000 years B.C.) to the latest developments of spirituality as reflected by thinkers such as Freud, Jung, Gandhi, Krishnamurti, René Guénon or Teilhard de Chardin. In a concise and at times elliptical style, Pichon analyses hundred of major and minor religious beliefs. He devotes enlightening pages to the birth and growth of North-America considered above all as a religious and masonic nation. Pichon himself was a free-mason for some time and his views are all the more accurate and critical. Of course, one is likely to find extensive details on the sects and secret societies in Pichon’s Histoire Universelle des sectes et sociétés secrètes (Vol. I & II 1968, reprinted in 1994). Still, one will pay special attention to the transformations which turned operative Free-masonry into speculative free-masonry after Anderson’s Constitution in 1723, for they help us to understand the shaping of the beliefs which led to the American and French revolutions. L’Homme et les Dieux unfolds a succession of cycles which the author deciphers for us. The history of mankind then appears as a coherent whole with its climaxes and ages of darkness, depending on what point of the cycle one is considering. 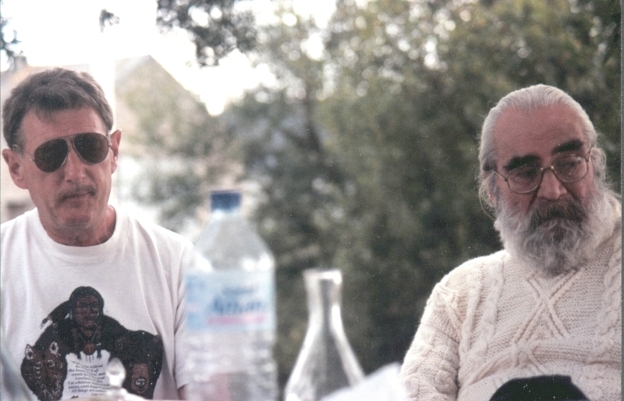 Before Pichon’s attempt, every scholar, researcher or author, including Mircea Eliade affirmed that it was impossible to envision such a book; although Eliade had written Le Mythe de l’Eternel Retour (The Myth of the Eternal Return). Only after L’Homme et les Dieux was published did Eliade dare undertake his gigantic study on the history of religions. As usual with Pichon, his book met with a divided audience : those who wholly admired it and those who found it too poetic, too partial, too lyrical, in brief too far from academic standards. In my view, Pichon dared what very few writers achieved except R. Graves or Roger Caillois, a harmonious blend of poetic intuition and undaunted knowledge. It is worth noting here an anecdote which I hold from Professor Behler (chairman of the Department of Comparative Literature of the University of Washington in Seattle) to whom Eliade declared : « I consider myself as a novelist first and a historian of religions second ». Pichon was a novelist first and perhaps he has never ceased to be one in a certain way. Pichon’s experience as a journalist left him with a profound understanding of human nature. As a chief reporter he covered the main criminal cases of the post-war decade. He often witnessed imposture on all corners of the court-room and more than once sided with the accused especially when justice was but a pretext to revenge in the years following WWII. Where were the monsters? On the bench between two policemen, testifying at the bar, presiding in long black robes, sitting among the jury or watching eagerly as spectators? In Le Juge (The Judge), a novel of 1951, Pichon shows apt at describing the landscape, the inhabitants of a small mining town of Peru with its affluent families, hard-working miners and poor peons. The precision and veracity of the descriptions led me to ask the author: « I did not know you had ever visited South America. When did you stay there? » He answered he drew all his information from a Peruvian friend of his. The main characters are Sam, the Indian judge who marries the daughter of a wealthy citizen, blonde and beautiful Margaret. The latter’s sister is almost a teenager, dark-haired and seductive Dalia. Very soon, Sam realizes that he is expected not to serve justice but to apply the laws as dictated by the important families of the town, everyone of which underlines that Sam may hold a university degree but that he remains an Indian, an outcast. On his way to a hacienda where he knows the owner has hidden the criminal record file which he stole from the police-station, Sam is attacked by a half-tame puma set loose by the owner himself. Sam kills the beast with his bare hands, a feat which reminds us of the Book of Judges (14, 8): « And after a time he returned to take her and he turned aside to see the carcass of the lion: and behold, there was a swarm of bees and honey in the carcass of the lion ». Let us quote Pichon now: « Nobody could understand him, unless one had eaten honey from the decaying carcass of an eighteen months lion ». Nothing could be clearer for bees are a symbol of Justice and there they feed on the rotting of a lion, a symbol of Hierarchy. On the very day of his wedding, Sam puts forth a riddle while all the guests are assembled: Out from the eater came forth meat, and out of the strong came forth sweetness ». But nobody could answer the riddle for everyone had forgotten the Book of Judges and thus paid no attention to the warning, the same Samson issued to the Philistines. Then Sam takes justice into his own hands killing those who out of blackmail pushed Sylva, his best friend and the honest owner of a small mining operation, to commit suicide. Sylva is a Frenchman, an alien like Sam. His name comes from the Latin Silva, forest, and we all know that the tree is a symbol of Liberty. Following Samson, the judge is bound in the end to be betrayed by the woman he has fallen in love with, Dalia. The Judge follows very closely the story of Samson and Delilah, proving through the author’s transposition that the Old Testament still makes a fabulous – in the proper sense of the term – thriller and adventure story. The novel is interspersed with phrases which read like aphorisms. For instance: « The Spirit of Revenge is red, but the Spirit of Justice is the pillar of the Temple; it is a rock, erect and bathed in Golden Light ». Or one of Sam’s last thoughts: « I entered the world of injustice the moment I was able to distinguish good from evil ». Pichon showed a marked preference for the format of the roman noir whose American exponents were popular in the 1950’s after the Liberation of France; the French readers and critics greatly contributed to give this genre its lettres de noblesse. During the same year 1951, another of Pichon’s novels, La Loutre (The Otter) was published. The hero, a travelling salesman, meets a young woman, Claire, a childhood playmate and falls in love with her. He decides he will kill his current wife, a trustworthy and amiable lady. He elaborates an intricate alibi for himself and comes back to his house to commit the crime. He pours poison into his wife’s customary aperitif. But the drug is not potent enough and she manages to drag herself to the bed-room. Spying from the garden, he sees her silhouette staggering to the bed. He enters the house, and while she is almost unconscious hangs her to the bed-post with the electric cord of the bed-lamp and leaves. Hardly has he left the scene that he decides he had better check on his deed. The figure on the bed is still moaning. So he stifles her with the pillow, killing her at last and one might say for the third time for good measure. He then catches the train to reach his alibi-place and learns, later, that his wife has been arrested for the assassination of the would-be lover of her husband. Actually, Claire, a friend of the couple had paid a visit and drunk the poison while waiting for the wife, late from work. The salesman explains how he made up his alibi but the police do not believe him. They think he is trying to protect his wife who serves a fairly short term in prison. When she is released, her husband faces the same dilemma: how to get rid of her, for good this time. The Otter in Western mythology is evidently linked with water, with the Moon and is to be taken as a symbol of Womanhood and Love. But Love has seemingly lost its meaning. The hero of La Loutre is an ordinary man who conceives an elaborate plot in order to escape the dullness of his marital life. The atmosphere of the novel is characterized by the lack of spiritual interests on the part of the protagonists and at the same time one can feel and almost measure the depth of some form of spiritual longing. What distinguishes Pichon’s novels from the roman noir (of a Dashiell Hammett or James Hadley Chase for instance) is that there is no private detective. In fact, the private detective is the reader placed in a position to observe and appreciate the various elements of the drama. Also typical of Pichon’s bitter irony is Il faut que je tue M.Rumann, 1950 (I must kill Mr Rumann) which was awarded a literary prize, Prix Sainte-Beuve, and was made into a television movie in 1960. The hero is a printing-press operator at Mr Rumann’s printing firm. He punches in every morning like every worker. However, the time-clock falls one minute and a half behind each day. On Friday morning, when the hero gets up, he benefits from 7 and a half extra minutes before going to work. He then enjoys his breakfast at leisure for he feels a free man. But one day, Mr. Rumann whom nobody has hardly ever seen pays a visit to his factory and he orders the foreman to check the time-clock every day. On the following Friday, the hero deprived of his extra seven and half minutes looks at himself in the shaving-mirror and says aloud : « Il faut que je tue M. Rumann » [I must kill Mr. Rumann]. And then adds: « But why? » as if the phrase had been dictated by someone else. The answer comes in a flash: « Because he is the boss and I have got a revolver ». Still Mr. Roman habits are quite secretive and the hero begins an investigation in the manner of a detective in order to find where he lives. For even the executive secretary whom he tries to seduce will not reveal this secret. At last, one day the hero is on his way to take his revenge. He manages to walk, with a group of guests, into the large home of Mr. Roman who is giving a party. When the master of the house momentarily leaves his guests, he follows him to his bed-room, pulls out his revolver and tells him he will kill him. Unfortunately the master of the house is not Mr. Rumann. This home is the wrong place. Discovering this, our hero runs away, pursued by the guests. Fleeing through various gardens, he climbs up a wall and rings at the door of an imposing mansion. He tells the man in an evening gown who opens the door: « The police are after me! » The man lets him in and asks him why. The hero tells his story: his only passion is literature; he wants to become a writer. He doesn’t derive the slightest pleasure from his job as a press-operator. Besides, Mr. Rumann has robbed him of his degree of freedom, those seven and a half minutes. The man answers: « When I was your age, I burned with the same fiery passion. I wanted to write, ideas filled my mind but my style was miserable so I gave up. Rumann could never have made a name as an author ». Our hero is even more startled when Mr. Rumann, for this is him, offers him a deal: « you will keep your salary but instead of working at my factory I will give you my journal and you will write my autobiography which I will sign with my own name ». Little by little, the book takes shape to the delight of Mr. Rumann for the young man has put all his passion and talent in the account of his boss ‘life. In the end, after much toil, the book is completed. Mr. Rumann could not have hoped for a more perfect rendering of his own thoughts. He hands his ghost-writer his last check, pours two glasses and picks up his fountain-pen in order to sign the manuscript. Then our hero realizes he is not only being robbed of his time. He exclaims : « Il faut que je tue M. Rumann » and pulls out his revolver. This crime is to be committed in the name of Liberty and Creation. The murderer is certainly likely to serve a longer term than the one who kills out of jealousy. Remember A. Camus’ The Outsider? Wasn’t the hero’s crime placed under the sign of the Burning Sun ? What court of justice could consider such motives as Liberty and Creation? Couldn’t they at least explain, give some reasons, in a word couldn’t they try to justify their acts? And what of their intolerable coldness? Don’t they have a heart? Not only are they guilty for their deed but all the more for their attitude. This is why those culprits should be punished with the utmost severity. Incidentally the American Heritage Dictionary says under the word culprit: origin unknown. It simply means like the adjective culpable that the culprit who has cut himself from society should be removed from it. At the time the Outsider was written, it could – and did – mean having one’s head cut off. In one of his autobiographies – Un homme en creux (The Hollow Man) – Pichon wrote : « … despair (or the sentiment of absurdity) was not bred from the lack of coherence of the Universe, but from the will, stronger than evidence, to find a meaning to all of our deeds, and from the belief instilled in us that we need a set of values ». There are many ways of cutting oneself from the rest of society. For example if you are a creator, creating entities, called Sam, the judge, or the salesman of the Otter and then the ghost-writer of Mr. Rumann. 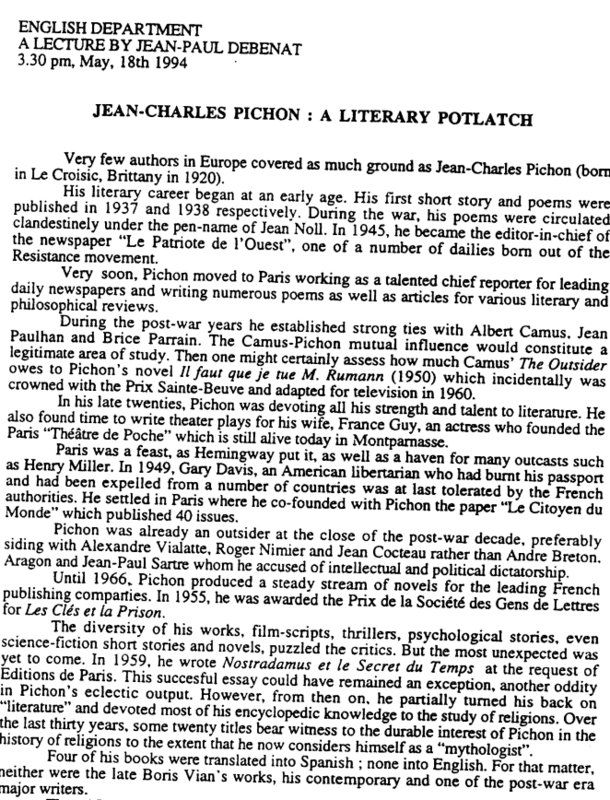 For Jean-Charles Pichon affirmed and demonstrated personally that the unity of the I, the much celebrated ego, in French je, was but a lure or a fiction. And he showed that he was multiple, or rather that he was born with a number of potentialities that he had to express, shedding them like skins after they were exhausted, until death comes, which is the only moment perhaps when the individual can say I, having at last reached his unity: a view that Pichon confirmed or destroyed when he wrote: « I refuse to die since I is another entity ». [Je ne veux pas mourir parce que je est un autre]. André Gide, Jean Cocteau and Colette might provide an answer. Pichon met A. Gide one morning strolling in the Jardin du Luxembourg. In his typical manner he did not say he was an aspiring writer; but during the conversation with the old master, Gide declared looking Pichon straight into the eyes that he could detect a stamp of strangeness about him. Jean Cocteau who admired Pichon’s works wrote to him that strangeness was the most striking and appealing feature of his literary output. And when Colette, the celebrated female writer died she left Pichon’s novel Les Clés et la Prison (The Keys and the Jail) open on her bed-side table at a page containing an aphorism on the strangeness of human condition. The student and the researcher would find a wealth of information in The Hollow Man (Un Homme en Creux) for it covers one decade of French literary history from 1946 to 1956. In it, Pichon speaks of Antonin Artaud, André Gide, Samuel Beckett, Ionesco, Paul Valéry, Hervé Bazin, Roland Barthes, Albert Camus. He also describes the birth of the « Théâtre de Poche » founded by his wife, actress France Guy, and his participation as a playwright in its creation. But The Hollow Man is also a confession, most abrupt and devoid of any artifice, that of the terrible, violent and passionate relationship which marked his married life until his wife died in 1954 after a prolonged and mysterious illness dubiously termed tuberculosis. Pichon confesses his liaisons with numerous lovers, women of letter, teachers and prostitutes. All the more politically incorrect, he invents a word: « carmiger » from the verb « charmer » (to charm, to seduce) and the verb « corriger » (to correct, to punish). « Carmiger » means to whip and « le carmige », this sweet sounding word means the whip that J.C. Pichon used for some years to satisfy the masochist desires of his lovers and his own sadistic tendencies. For another term could characterize his career: scandal. And it is true that his behavior, his approach of reality or realities were and remain scandalous. To the extent that some readers burnt their copy of Les Dieux Etrangers or Un Homme en Creux. For that matter, during the Second World War, let us remember that Pichon published his clandestine poems under the pen-name of Jean Noll (John the Devil in the Breton language). But above all, one should consider, always, this other confession: « I lived the Judge from January to September 1951, Serum and Co. from September 1951 to June 1952. But between each experience, there was a crisis on which I can precisely put a date ». The constant involvements, the utter poverty, the all encompassing meditation, the inbred need to pursue a long quest which led him to study the history of religions, appear to me as evidence of Pichon’s unquestionable sincerity and courage.